What does one say when they had just completed their best running month in the past 6 months? 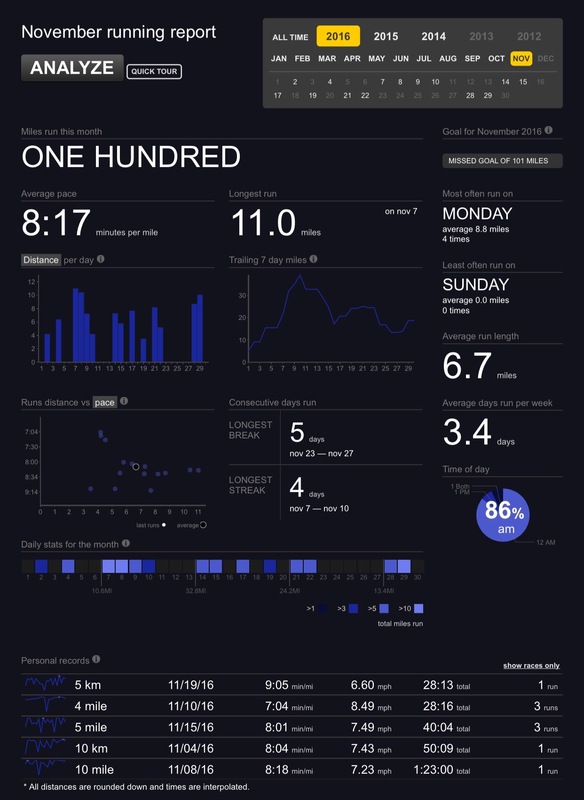 To steal a line from Bill Belichick, “I am onto December!” I cannot lie though – I am happy that my running in November was strong (100 miles at an 8:12 pace) but as this year has been a difficult one injury rise, I don’t want to say I am out of the woods yet. Give me another month of good running and another and another…. I crossed 1000 miles for the year. A good achievement and 10% higher than my total for all of 2015 but still below my goal of 1300 for the year. At this point, if I was on target for that amount, I would be currently at 1198 miles so I am 20% behind my goals for the year. I ran on average 3.4x per week which is far below my longer term average that is above 4. I am running longer though on average so I am running less but with more miles. My average run length for November was almost 7 miles whereas I only averaged 5.8 miles. Very little running on the weekend hurt me. I ran zero times in Sunday’s during November. Zero…! Coaching hockey is largely the reason but I need to make a better effort to get out over the weekends! So with November out of the way and 31 days left in 2016, where do I stand on the year? Heading into this morning, I sat at 1,015 miles for the year which put me on a pace for about 1110 for the year. Here are a few other highlights. 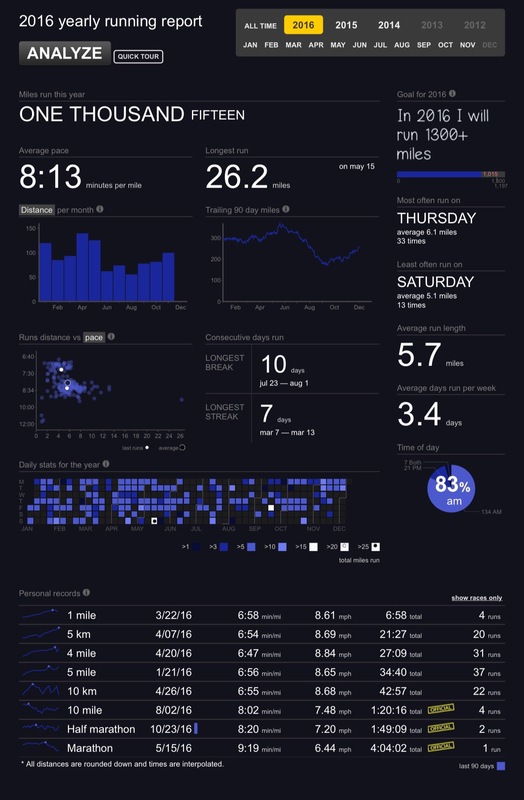 My 90 day look back of miles is at its best level since late July – it sits at 262 miles. If one is looking at it as if my running was a stock price, my running has “broken out” and much better numbers are forthcoming! My average pace for the year sits at 8:12 – last year it ended at 8:48/mile. Average run length in 2015 was 5 miles per day – in 2016, that sits at 5.7 miles. My average runs per week is up to 3.4 from 3 last year. So overall I am happy with the trend of things. Hopefully I can finish December strong! Previous Post Being Carried Away by the Broomstick!